The latest release from the team at Revolucion Records see's them welcome a new name to the team in the form of up and coming Spanish based hot shot Christian Dashalcri. After gaining the attention of the Revolucion A&R team with his 'Sexto Sentino' track earlier in the year, his talent for producing quality music on the deeper side of house was instantly recognized and he was signed up immediately. 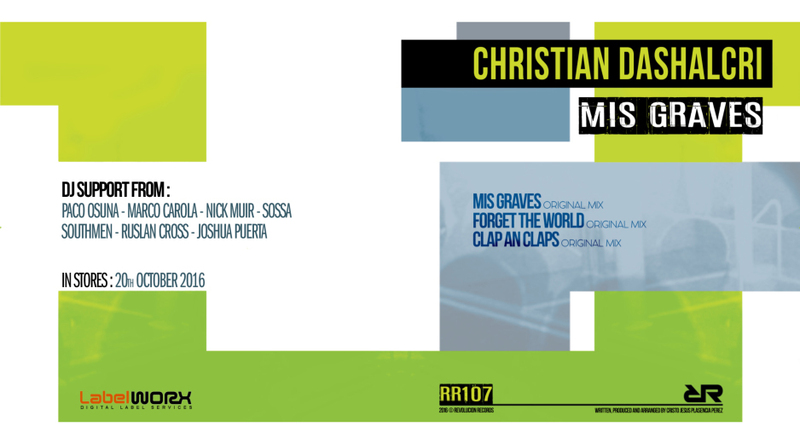 Up first comes the title track 'Mis Graves', a deep chunky groover which gets things off to a fine start, up next comes the deep techy undertones of 'Forget The World' before rounding things off with 'Clap An Claps' another one perfect for those deeper moments. Written, arranged and produced by Cristo Jesus Plasencia Perez.